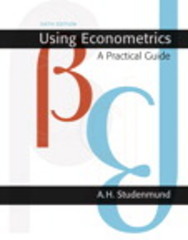 Using Econometrics 6 Edition A thorough and beginner-friendly introduction to econometrics. Using Econometrics: A Practical Guide provides readers with a practical introduction that combines single-equation linear regression analysis with real-world examples and exercises. This text also avoids complex matrix algebra and calculus, making it an ideal text for beginners. New problem sets and added support make Using Econometrics modern and easier to use.